These two flute cutters offer a method of mitre jointing timber with a double tongue arrangement. This locks the joint against movement and provides a long glue line for maximum joint strength. Each cutter is suitable for use with timber in the thickness range indicated in the table below. A router table with fence should be used, and the accuracy of the joint is improved if the fence has a timber face, which should be as tall as practically possible. This helps keep the timber upright whilst the cut is being made. To produce a 90 degree joint, one piece should be machined horizontally on the table, whilst the other is machined vertically against the fence. NB: T5596½ and T5598½ are large cutters. Please ensure they are suitable for your machine. 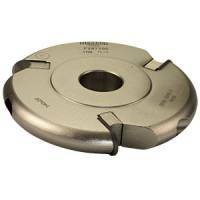 These large cutters should only be used in a fixed machine and at 10,000 rpm maximum.